Universal Display announced it will supply phosphorescent OLED materials to the Fraunhofer Institute which will use them to make efficient white OLED lighting panels. The two companies signed a two-year agreement under which COMEDD will develop and produce OLED panels "for market development". The upcoming panels will use UDC's all-phosphorescent solution. The Fraunhofer is already producing and shipping OLED lighting panels, including structured and transparent ones (we posted our on-hands review just yesterday). The Fraunhofer does not plan to mass produce their panels, they are just meant to help interested people experiment with this exciting new technology. 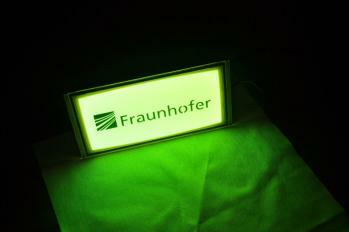 Of course in the future the Fraunhofer may license or spin-off its production technology.